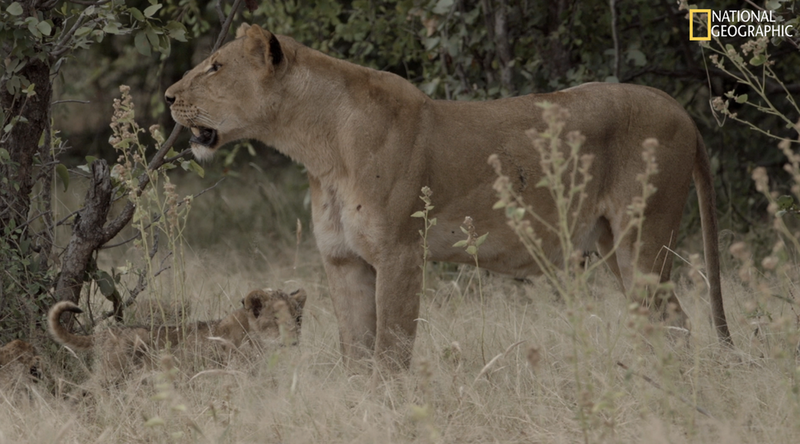 The researcher working alongside us on the film has discovered 3 new lions. A few days ago, 3 tiny cubs were spotted with their mother around sunset, estimated to be approximately 8-10 weeks old. 2 days ago, they were found again, early in the morning, providing us a great opportunity to settle in close by, and document those dear moments in their infancy. The mother, identified as lion F109, remained in the shade for most of the day, with the cubs using her as a jungle gym, amusing themselves while she slept. She lay on her back, allowing her offspring to suckle her nourishing milk, with their father, and 3 other lionesses/aunties scattered close by. Their relentless playing and inexhaustible energy began to get on her nerves, and she would let out an occasional snarl, silencing them quite quickly. They approached more gingerly now, trying not to annoy her while she rested. At times their sharp teeth and claws became an irritant, and she refused them milk, rolling onto her other side, or repositioning a few feet away. Nonetheless, they continued to bound around her feet, chirping away for food, and she would ultimately lay down and give in. The total count in the national park has now been raised from 17 to 20 lions , confirmed and identified by the researcher.